It’s 2017, and apparently, we still have to fight Nazis. This fall, The UF Chapter was at the center of organizing against the appearance of Richard Spencer at the University of Florida. The preppy Spencer, who talks a bit like the grad student he once was, pretends to be promoting free speech, all the while attempting to create legitimacy for his deeply unpopular white supremacist views. But Spencer’s centrality at the deadly white supremacist rally in August in Charlottesville, VA, shows that his message of “peaceful genocide” was never anything less than an incitement to violence. Spencer’s speaking tour targets public universities. This allows him to take advantage of First-Amendment case law, which holds that public institutions that allow outsiders to rent facilities for speaking events can’t discriminate against them on the basis of speech—unless speakers present a prospect of imminent danger. Just a few weeks after the events in Charlottesville, UF denied Spencer’s request to rent a speaking venue on exactly these grounds of safety. But then, several weeks later, they reversed course, and granted Spencer his speaking venue. In the weeks leading up to the event, the question of how to respond to Spencer was hotly debated all over our community. 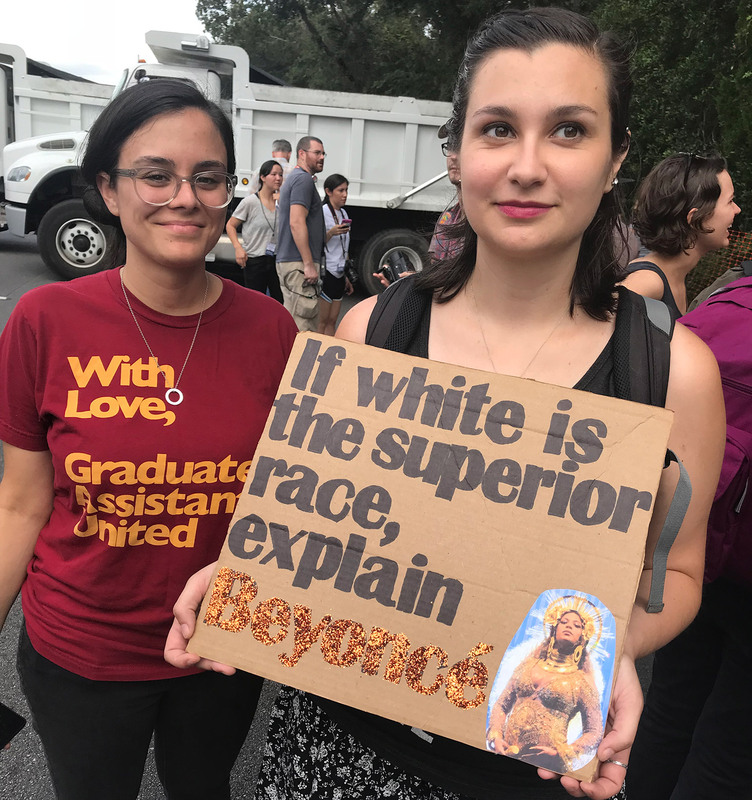 Many of us were deeply angry and fearful—especially in the wake of a number of incidents at UF of racist intimidation against faculty and students of color. As a union chapter, we were compelled to address how contract provisions against discrimination and on the university’s obligations to provide safe working conditions applied to this event. Along with student leaders, we pressured the university both publicly and privately to cancel the event on the grounds of student and employee safety. Instead of standing up to Spencer and paying for a legal battle, UF chose instead to spend its money on security, and to turn part of campus into a militarized zone. The university spent over $600,000 just in security for the event. Governor Scott declared a state of emergency, and police and guardsmen from around Florida were mobilized to join Gainesville and campus police in cordoning off Spencer fans and protesters. There were snipers on rooftops, and police helicopters circled the campus. 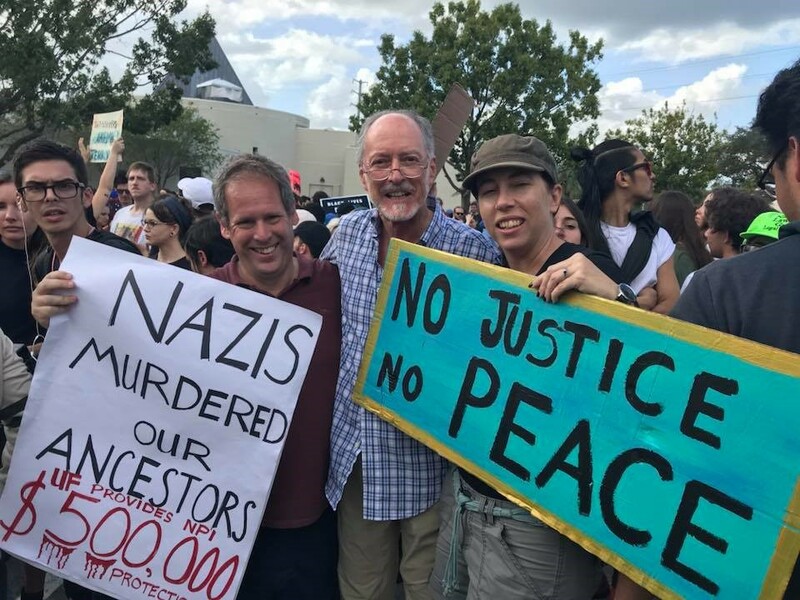 Despite the urgings of the UF administration to stay away, thousands of students, faculty, and community members turned out to protest Spencer and white supremacist hate, far outnumbering the Nazis and other members of the alt-right, who were in visible attendance. Unfortunately, this show of solidarity against hate was not enough to stop at least one potentially tragic incident, when one of Spencer’s followers shot at a group of protesters. He was later arrested on charges of attempted murder. In the end, we were thus confirmed in our view that Spencer’s presence on campus was a danger to public safety, and should never have been allowed to happen. 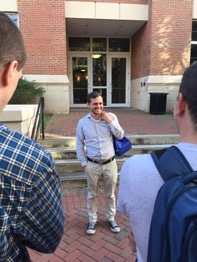 More information about UFF-UF's response to the Richard Spencer speaking event is on our chapter web page (http://www.uff-uf.org/uff-uf-responds-to-white-supremacist-speaker-on-campus/). In 2016-17 UFF membership growth was near 8% with over 7,400 members at the end of the 2016-17 academic year. This was the first time ever UFF membership rose above 7000. At its Delegate Assembly in October, FEA awarded its 2016-17 Membership Awards. Eighteen of our 28 chapters were recognized and several chapters received both awards. UFF will recognize these chapters again at our February Senate meeting. CONGRATULATIONS TO ALL OF OUR CHAPTERS FOR THEIR WONDERFUL ACHIEVEMENTS!!! Legislative Session to Begin January 9! We are one month before the convening of the 2018 Legislative Session, however, much has happened already during the Interim Committee meetings. Here is an update on what has happened regarding higher education issues. On December 5, PCS for HB 25 by Rep. Scott Plakon (R-Longwood) passed out of the House Government Accountability Committee on a 14-9 vote with only one Republican member, Chris Latvala (R-Clearwater), voting against the bill. PCS HB 25 has no other House committee reference so it can be taken up on the House floor sometime after the Legislature convenes. The bill, if passed by the Legislature and signed by the Governor, would add an additional requirement to an employee union’s annual renewal with the Public Employees Relations Commission. That requirement is that each certified bargaining unit (each UFF chapter) of a registered employee organization (in our case UFF) must provide the number of eligible employees for union membership and the number of members who pay dues or do not pay dues. If that information is not presented then the certification for that bargaining unit is revoked. If the certified bargaining unit dues paying membership is less than 50%, that bargaining unit must petition PERC for recertification as the exclusive bargaining representative within one month after the date on which the bargaining unit applied for renewal. Application for PERC recertification requires either voluntary recognition of the union by the employer or petition to PERC for recertification upon submission of call for union representation election cards from at least 30% of the full bargaining unit. The bill has a Senate companion, SB 1036, sponsored by Senator Greg Steube (R – Sarasota) which has not yet been referred to Senate committees. The Florida Polytechnic chapter of the UFF has spent Fall 2017 in a series of ongoing, regularly-scheduled negotiations for our first collective bargaining agreement. Negotiations is underway, with regular meetings scheduled through the current Fall semester. While at times the progress has been a little slower than we might have preferred, it has been progress nonetheless. Because of these promising early results, FPU-UFF President Rich Matyi was invited to Tallahassee Community College to address the TCC BOT on Monday, November 20. The message supporting our TCC brothers and sisters was simple: that moving forward in CBA negotiations is indeed possible. Additionally, at the recent FEA Delegate Assembly meeting, the Florida Poly chapter won its first award: the FEA Gold Membership Award. Undoubtedly there will be more to come! Meanwhile, we continue to actively reach out to our newly-arrived faculty through both one-on-one discussions and social events. 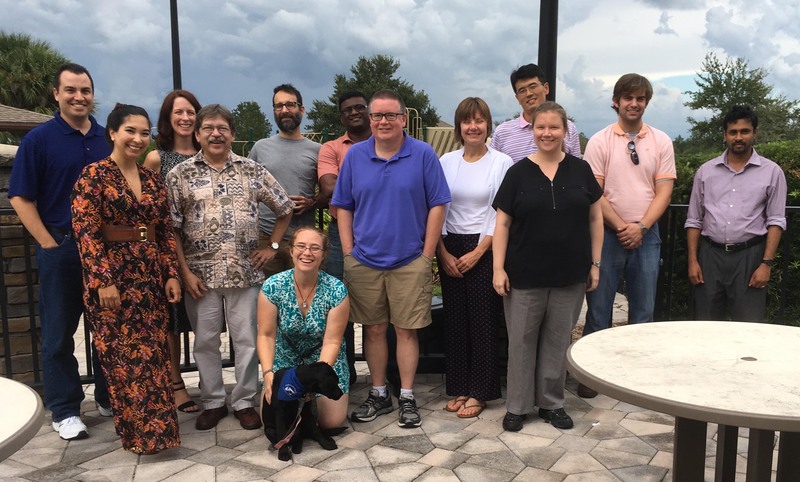 At the beginning of the Fall semester on Friday, September 1, an off-campus poolside social hour allowed new faculty to meet with UFF members to learn of the advantages of union membership. More recently, after our November 15 CBA negotiation session, the FPU-UFF held a pre-Thanksgiving potluck lunch to update current and potential members on the CBA status – and to serve some *very* tasty post-negotiation food. The UFF-SCF chapter won a 2017 FEA Gold Membership Award. The chapter will circulate the award among departments to showcase the dedication of faculty in all areas of the college. During bargaining sessions, the SCF chapter negotiations have stopped the college from imposing a number of workplace terms and conditions of employment, including changes to annual evaluation, mandatory accessibility training, and college-designated random compensation for online course materials. Excellence Awards: College president Dr. Carol Probstfield had indicated at Board of Trustee meetings and elsewhere that faculty are not eligible for this “first round” of Excellence Awards due to status quo during bargaining. During bargaining, lead negotiator Julie Jakway informed the union that awards ranged from $1500 to $10,000. Probstfield sent a letter to the college employees congratulating the recipients of “Excellence Awards” and reiterating faculty’s exclusion. Senator Jeff Grieneisen responded (copied to all college employees), informing the president that the union chapter is willing to sign a memorandum of understanding allowing faculty to participate in this award, and encouraging meaningful participation of faculty in shaping the future awards parameters. Chapter president Courtney Ruffner has made a public records request for a list of award recipients. The bargaining team has sent to the college’s team a number of articles, including Academic Freedom, Shared Governance, Discipline, and Leave. What could be better than a Friday afternoon of food, fellowship, and fundamentals on union membership benefits? The program was provided by Professor Christina Goodell, a UFF-FSCJ Team member. The educational session was hosted on Friday, November 17, 2017. Attendees learned of the member benefits through UFF-FSCJ that, as members of UFF-FSCJ, also gain membership to NEA, AFT, and of course UFF. Did you know that you can find your Union Membership ID on the NEA Higher Education Advocate Magazine above your address? Attendees established member benefit accounts online and learned directly of the numerous benefits available and applicable to each individual. 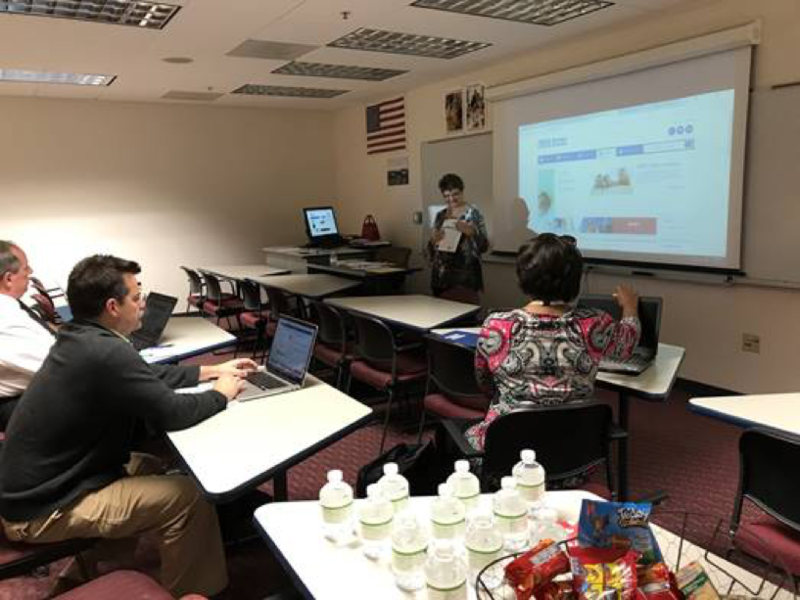 For example, some attendees were interested in the discounts available to union members; others in the teaching resources; while others in the retirement planning offerings. Also, members enjoyed fellowship together in small groups to share current issues and to share best practices. UFF-FSCJ President Harvey Slentz shared the benefits of union representation that we, as members, enjoy. Future educational topics were also recommended by our member attendees. This educational session closed out our program offerings for 2017 with much appreciation from attendees. More are scheduled in 2018 by UFF-FSCJ, thanks in large part to the interest and recommendations of our UFF-FSCJ members. The fall has sped by. The last category of our negotiated raises for this year was added to faculty paychecks over the last few weeks. Bargaining was difficult this year, as our BOT representatives started with a package totaling just 1.2%. Over many weeks, our Bargaining Team negotiated a final package of 3.66%, including line items like performance increases that were not even a part of the BOT’s first offer. We are already planning for next year’s bargaining, set to begin in February. In other areas, we had a very successful recruiting season, with about two dozen new members joining the day of Orientation alone. Our monthly social events and luncheons have included guest speakers Alan Gummerson from FIU and representatives of the FEA. These have been extremely well attended, including two at family-friendly venues. For the third year, we sponsored our “UFF Goes to the Opera” event at which over 100 union members and their guests attended FSU Opera’s production of Bernstein’s Candide. We’ll finish the semester with an unusual happy hour at the Goodwood Museum, which is featuring a photo exhibit from the FAMU Black Archives called “Ascension,” about the rise of the Black middle class. The director of the archives, Dr. Nashid Madyun, will be giving us a tour of the exhibit. UF-GAU has extra reason to celebrate this holiday season! On November 13th, UF-GAU signed the final tentative agreements for our 2018-19 Collective Bargaining Agreement. It has been a very trying year of negotiations, which included an attack on our healthcare and dependent care as well as misleading offers from the university concerning raises and salary minimums. Regardless of these obstacles, we managed to come to a final agreement with several notable wins and are now preparing for ratification. Thanks are due to our bargaining chair Bobby Mermer, who led these negotiations on our behalf with grace and savvy. In November, we conducted our general body meeting, where we approved our budget and proposed a new line item for travel grants as incentive for graduate assistants to join GAU. We also discussed the search for a replacement for our longtime organizing chair Sebastián Sclofsky, who will be graduating in the spring. During his tenure, Sebastián has done an incredible job rallying our members, most recently with our "Top Ten Party" event this semester as well as our “GAU Cares” rally in the spring. Finally, the members discussed the proposed revisions to the Constitution and Bylaws from UFF Senate. As a chapter, we will have an election to determine how our senators would vote at Senate. This measure was met with unanimous approval from those present. 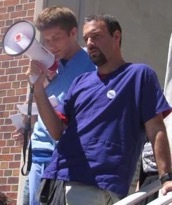 Sebastián Sclofsky on right, with former UF GAU president Alec Dinnin, at our GAU Cares rally this past spring. UFF-Broward College successfully extended, by two weeks, the college's open enrollment period for benefits this November. The college had listed different dates on several of its notices, resulting in confusion and some members missing the shorter of the deadline dates. UFF-Broward pushed the administration to extend the open enrollment period to the end of the month to accommodate everyone's enrollment needs and benefit elections!